Living in the country need not mean having to use one’s car for every journey. Bus services may be limited but are by no means non-existent. It’s possible, for example, to travel to work or to shop in Shrewsbury by bus. There are, too, other options that cut down on car use, such as car sharing schemes, that can save money, reduce wear and tear on your car and reduce your carbon footprint. The X75 service between Newtown, Welshpool and Shrewsbury runs through Halfway House, Wattlesborough and past Cardeston 6 times a day in each direction. 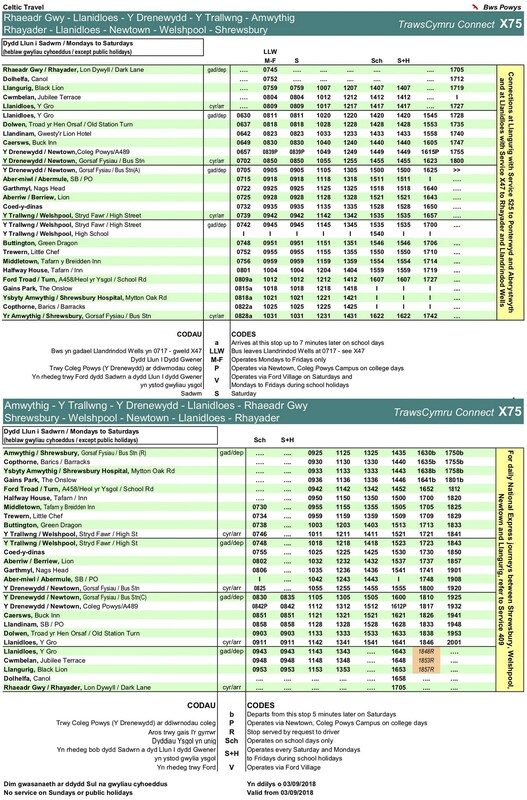 The 74 service from Llanfyllin to Shrewsbury serves Alberbury with up to 4 buses a day in each direction (with an extra one on Saturdays and school holidays). For fare information visit www.tanat.co.uk or ring 01691 780212. In addition to timetabled stops both services will stop anywhere on route where it is safe to do so on receipt of a clear signal to the driver. Residents aged 60 or over can obtain a pass (issued by Shropshire Council) that entitles the holder to free bus travel anywhere in England and also on any journey that crosses the Welsh border in either direction. The passes can be obtained online, from Shropshire Council’s Community Hubs at Castle Gates, Shrewsbury or Oswestry Library, or ring 0345 678 9088. A pass for those with a disability is also available. These can only be obtained or renewed at Community Hubs. There is also a companion or carer’s pass if such help is needed to use bus services. The Oxon P+R site (behind the Co-op on Welshpool Road) is conveniently situated for parishioners travelling into Shrewsbury, with fares providing savings over the cost of parking in the town centre. Buses run every 20 minutes from 7.20am Monday to Friday (8.00am on Saturdays). The last bus from the town centre leaves at 6.30pm. The return fare is £1.60 per person for adults, 80 pence for pass holders after 9.30am, and college and high school students showing ID. Multi-trip tickets, offering savings, are also available. National Expressservice 409 runs between Aberystwyth, Shrewsbury (leaving the bus station at 10.45am), Birmingham and London Victoria. There are also stops at Halfway House (10.12am) and Ford (10.20am). Service 410 runs on Monday to Friday from Shrewsbury to London Victoria via Wolverhampton and Birmingham at the unearthly hour of 06.35am. Bookings can be made at www.nationalexpress.com or from Traveltime and News at Shrewsbury Bus Station (tel. 01743 231010) or from Welshpool TIC. National Express offers a range of discount cards (Coachcards) similar to those available for rail travel. Both local bus services can accept wheelchairs and pushchairs. National Express can accommodate wheelchairs if notified in advance on 03717 818181. For those with special requirements if they are to travel, Shropshire Council coordinates a Voluntary Car Service. Call 0345 6789006 for details. Shrewsbury Dial a Ride can provide transport within 10 miles of Shrewsbury town centre (and therefore covering most of the parish) for the elderly and those with limited ability to use other transport. For those able to organise a group of participants they may be able to run a regular shopping trip, picking up from home and using accessible transport. Call 01743 450270 (Mon-Fri 9.30am-3.00pm) or visit www.shrewsbury-dialaride.co.uk for details. Why not consider car sharing with someone making the same car journey as yourself; either as a one-off or regular arrangement? Payments to cover costs (though not to make a profit) are permissible, or you can take turns to provide the car. Find a partner by registering with www.carshareshropshireandtelford.co.uk (a scheme promoted by Shropshire and Telford Councils) where further details can be found. While Shrewsbury may be the obvious station for parishioners, Welshpool station could be more convenient, offering free parking adjacent to the station and ramp access for those with restricted mobility or wheelchairs. A range of railcards (including Senior, 16-25, Two Together and Family and Friends) are available and worth considering if you are a frequent rail user. They offer 0ne-third off normal fares. Contact www.railcard.co.uk or ring 0345 3000250. 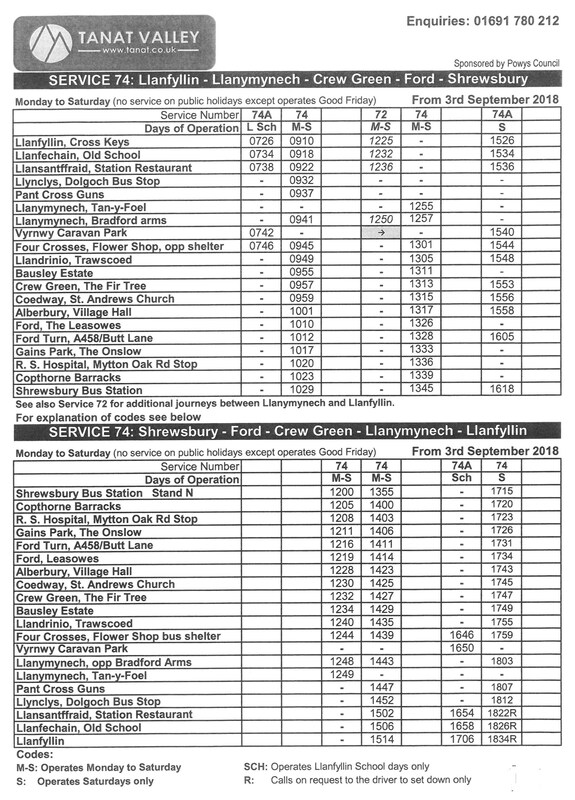 (www.traveline.info or 0871 412231) or Traveline Cymru (www.traveline.cymru or 0800 4640000).